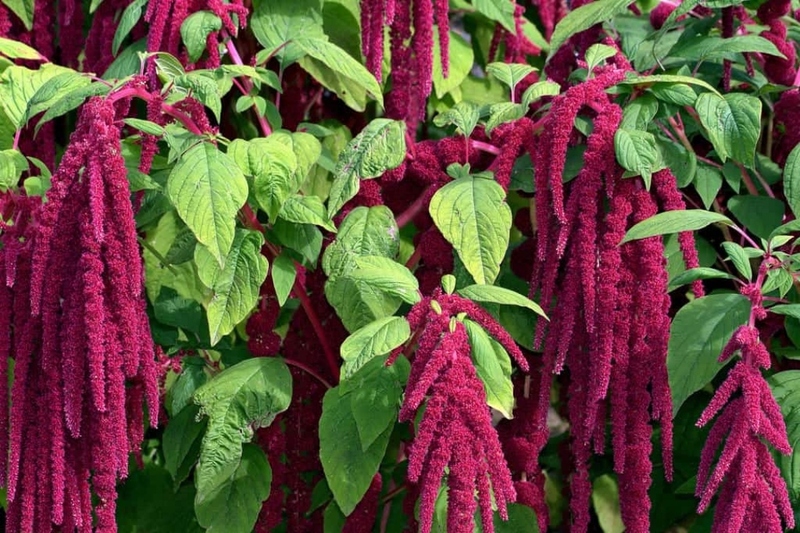 Love-lies-bleeding (Amaranthus caudatus): growing, planting, caring. Did you know? During the Victorian era, specific flowers had different meanings. Love-lies-bleeding stood for hopeless love or hopelessness in the Victorian language of flowers. Amaranthus caudatus - the love-lies-bleeding - is a species of annual flowering plant native to the American tropics. It can grow anywhere from 3 to 8 feet in height, growing best in full sun, handling a variety of conditions, both humid and arid. It is usually planted as a summer annual, or started indoors in early spring and transplanted outdoors after the last frost in temperate climates. The Love-lies-bleeding is a perennial usually cultivated as an annual, growing up to 1.5m tall, with green, oblong leaves and pendulous panicles of crimson flowers. In April, sow under cover at 20 ° C. In May, sow in open ground. The seeds are very small; also sow as much as possible. Thinning is unavoidable; keep only one plant every 60 cm. The seedlings sown in buckets are ready to be transplanted as soon as the plant reaches 10 to 15 cm in height, about two months after sowing, and of course after the last frosts. Plant amaranthes in full sun in a well-drained soil, rich in humus, remaining fresh or in partial shade, in finely worked culture beds (spotted, scratched then raked). Once the area is properly prepared, simply make a small hole in the dibble, remove the plant from its bucket, put it in the hole, and compact the soil to put it in contact with the roots. Install the seedlings at a distance of 60 centimeters from each other. Water copiously to facilitate rooting. Water seedlings in fine mist, maintaining the soil always moist - if in a pot make sure you use drainage pots. After a few weeks, watering once a week should be fine. Avoid spraying the leaves, especially for plants indoors. Amaranthes multiply mainly by sowing, so consider harvesting the seeds in late summer, and sow them in open soil in May. It seems silly to say, but annuals such as amaranth should be removed at the end of the season! For plants with superficial rooting, simply pull on it, with the help of a tool.